Uphill from Karlovy Vary’s famous colonnade with its lavish, pastel-colored buildings, a little off the beaten track in the city’s Westend neighborhood, visitors to the West Bohemian spa town can find a great example of stunning early 20th century architecture: the Becher Villa. Built by Gustav Becher, a member of the famous Becher family, probably best known for founding the Becherovka distillery, the villa went through many changes in its nearly 100-year history. It is hard to imagine that the villa, now fully reconstructed, was at one point completely run-down and was not accessible to the public for over 20 years. Restored to its former glory, it was re-opened to the public in July 2010, and now houses an interactive gallery and several workspaces for artists. I spoke to Jan Samec, the director of both the Becher Villa and Karlovy Vary’s art gallery Gallerie Umění, about who originally built the villa. “It was Gustav Becher, a member of a very well-known family in Karlovy Vary. Many members of this family were doctors, pharmacists, city councilors and even mayors, and worked in other important professions. Gustav Becher at one point took over the well-known liquor company from his father, but in 1901, he signed it over to his step-brothers, because he got married. At the age of 64 he got married to a 24-year-old, and I think it was because she did not like living in the house where he was born, on the colonnade, that he decided to build this villa, in the new, mundane Westend neighborhood.”Westend is a villa neighborhood full of great estates that were built during the city’s heyday, and the Becher Villa provides an interesting insight into the style of architecture that was popular before the First World War. 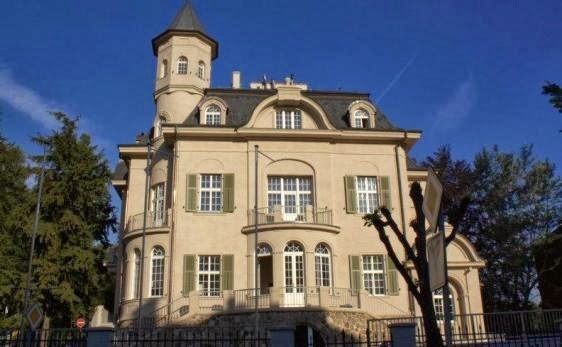 To impress his young wife, Gustav Becher decided to design the house according to what was the height of fashion at the time.“I assume that he had this villa built mostly because of her. It can be described as having in essence a Palladian style, with an atrium in the middle, the way that style of architecture was adopted in Victorian England. At the time, it was even called “Englisch Haus” and since it was built right before the First World War, there was some influence of the Secession style, and also, but rather as a consequence of the reconstruction, elements of art-deco could be found here some eight to ten years later.”However, Gustav Becher himself died in 1921. Since then, the villa changed hands several times, and its owners were not always respectful of the building. Jan Samec briefly sums up the history of the villa between the years 1921 and 1987. “Mr. 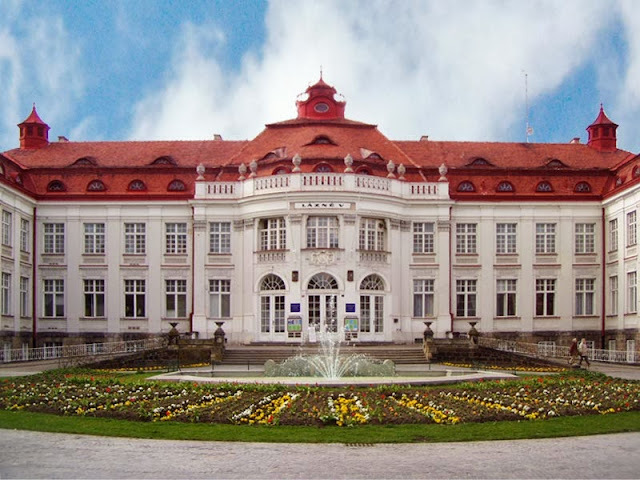 Becher did not get to enjoy his villa for very long, he died in 1921, and his wife sold it to the association of chemical and metallurgical producers from Ustí nad Labem in the first half of the 1920s, and they used it until 1938, when this part of what was then Czechoslovakia was taken over by Nazi Germany, which installed the regional headquarters of the SS here. When we were reconstructing the villa, we even found an old SS sign, which we kept for reasons of historical documentation, and after the war, the building became the possession of the Czechoslovak state, which transformed it into a youth center.”The youth center, Dům pionýrů a mládeže, was situated in the villa until 1987. The villa was closed to the public for several years after that. In the late 1990s, the education office of Karlovy Vary, to which the building belonged at the time, decided to transform the building into a musical education school. However, the reconstruction was interrupted several times and the building site was vandalized and looted until the villa fell into complete disrepair. 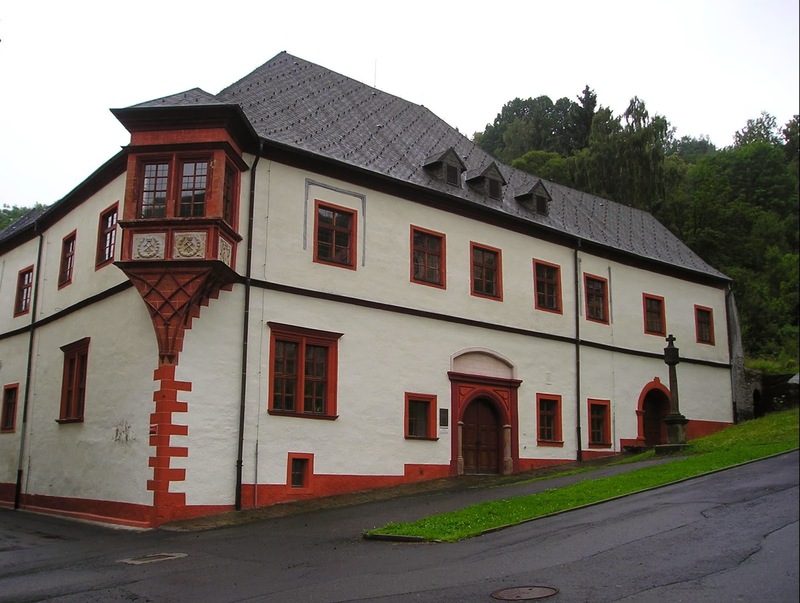 It wasn’t until the Ministry of Schools signed it over to the region of Karlovy Vary that the villa could be saved. Gallery director Jan Samec was approached by the region’s officials regarding its renovation and reopening. I asked him how long the actual process took.“I have to say that the preparations took much longer than the actual reconstruction. We had to prepare a report about how we intended to use the space, then we had to apply for building permits and EU funds, because a large part of the 86 million Czech crowns that it cost to renovate the villa, a substantial portion was paid for by the EU, and the rest was financed by the region of Karlovy Vary. So we started the reconstruction itself in 2009, it took 9 months to complete, and was finished in early July 2010.”Part of the reason that the project received EU funding was the unique concept that Mr. Samec came up with: aside from giving the public a chance to see the beautiful villa from the inside, the reopening also brings a very modern gallery to the spa town, where visitors can not just look at art, but interact with it. The name already tells you something: an interactive gallery is a bit different from a traditional one. Here, you can see interactive exhibitions, presenting works that the visitor can change or play with in some form, climb into them, etc. which today is quite fashionable. But we take the interactive concept a bit further. For example, right now, we are showing a porcelain exhibit featuring local artists, and they also teach workshops and other seminars, and we then exhibit the pieces that are created by those who attend the workshops, and so within the three months that the exhibition is going on, it will undergo a big change and be completely different at the end.”In addition to the current exhibition of beautiful ceramics by local artists, titled VARY(I)ACE 3 + 1 = PORCELÁN, the villa also currently has a couch designed by the late architect Jan Kaplicky on display. The ceramic oven, the art library and the several studio spaces in the basement testify to the ambition of Mr. Samec to offer artists’ residencies in the future. For many residents of the spa town, however, the Becher Villa brings back childhood memories, since for decades, most local children and teenagers would visit the youth center in the villa.“I just learned, when we had an opening, that our mayor went here for a first aid course, so I have to say that for the majority of Karlovy Vary residents, this house is very connected to their childhood, and a lot of them came to look at it for that reason.” But even for visitors who do not have this connection to the Becher Villa, the beautifully renovated building, which is open year-round, is well worth a trip. The former Royal Mint is located on the square over the town hall of famous mining town and it was built with the pomp proportional to its importance. The two-storey house from Renaissance age has a tower-type bay window, great hall and rectangular courtyard. The house was built through the years 1534-1536. Present state of the building is the result of several reconstructions. The core of the house as well as several window flannings, portal jambs, rare chimney hook or large basement remained preserved to these days. The artistically most valuable part is the prismatic bay window with the haunch reinforced with groins. There is a year 1536 signed in the middle of its window flanning. Mining shields around the sign of the year are modern. The building served as the Royal Mint till the beginning of 17th century. The forefront and the adaptation of the portal are baroque. The mining and metallurgic administration of Jáchymov resided here since 19th century. The museum has resided here since 1964, the reconstruction of the whole building took place through the end of 80´s and the beginning of 90´s. Present state is the result of this extensive reconstruction. The Royal Mint belongs to the first category monuments. In the past, a restaurant for excursionists and the "U Tří křížů" (Three Crosses) Café had stood on the plane of the former Rudolfova výšina (Rudolf's Height) below the Three Crosses. In the 19th century, the site belonged among the most frequently visited outing destinations of the spa guests. The original Camera Obscura (Dark Chamber) arbour where pictures of the landscape were projected on the wall of the dark chamber used to stand in the restaurant garden. The original arbour had fallen victim to a devastating overnight windstorm in 1990. The present-day wooden lookout arbour was built on its site 1997 thanks to the initiative aimed at the restoration and revival of vanished or dilapidated structures in the spa woods. Master tailor Felix Zawojski had this beautiful Art Nouveau house built in 1900 for his fashion salon in Tržiště (Market) Street in the historical centre of the town. The impressive Art Nouveau building was designed by Viennese architect Karl Haybäck. In the early 20th century, Zawojski's salon was the most popular and most stylish fashion studio in Karlovy Vary. It enjoyed a very exclusive clientele from all over Europe. Zawojski counted royalty among his customers, including English King Edward VII or Muzaffar Eddin, Shah of Persia, to name a few. In 1910, the very first burgher house lift in Karlovy Vary was installed in this building. The following year, Felix Zawojski sold the house. A branch of Živnostenská banka (Czech Trade Bank) was established in it. Between 2006 and 2008, it underwent a complete reconstruction and conversion into a luxury hotel in the old-world style. The sophisticatedly restored Art Nouveau façade won 1st prize in the "2007 Façade of the Year" competition. The oldest standing lookout tower in Karlovy Vary was erected on a popular observation point in the spa woods above the town in 1876. The Pseudo-Gothic brick lookout tower resembling a minaret with two lookout galleries was built as a copy of a lookout tower standing in Schleswig in northern Germany. The lookout tower was named after Emperor Franz Joseph and it was opened to the public in the spa season of 1877. The lookout tower also served as an arbour and after its opening, it soon became very popular among the spa guests. Fireworks were fired from the first lookout gallery at various festive occasions. Following World War I, the lookout tower was renamed to Josef's Lookout and it has been known as the Lookout of Charles IV since the end of World War II. In 2001, the unique historical structure underwent an extensive reconstruction. 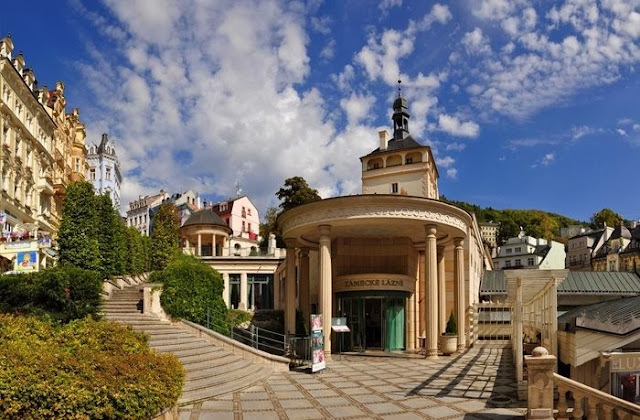 The magnificent and vast Pseudo-Baroque complex of spa buildings resembling a castle was built between 1905 and 1906 according to the design of the Director of the Municipal Building Office, Franz Drobny, in the northern part of the centre of Karlovy Vary. The building was named Alžbětiny lázně (Elizabeth Baths) in memory of the murdered wife of Emperor Franz Joseph I, Empress Elisabeth, commonly known as Sisi. A French-style park with a fountain and a four-rowed alley was founded in front of the spa, i.e. the present-day Smetana Park. The grand opening of the Elizabeth Baths took place on 18 June 1906. The new spa facility provided almost two thousand procedures every day. Following the foundation of Czechoslovakia, the complex was renamed to Lázně V (Spa V). A major renovation of the interior furnishings and equipment was carried out between 1969 and 1973, during which a modern rehabilitation indoor swimming pool with two saunas were built in the atrium. As a result of an extensive reconstruction effected in the early 21st century, the Elizabeth Baths have become the largest balneological facility in Karlovy Vary, which provides more than 60 spa procedures exploiting thermal water and peat. The seep of the Zámecký pramen (Castle Spring) first appeared in 1769 below Zámecká věž (Castle Tower) in the historical centre of Karlovy Vary. After performing a chemical analysis of the spring, Karlsbad physician Dr. David Becher proposed the exploitation of the mineral water for balneological purposes. The first arbour was built over the Castle Spring in 1797. An eruption of the Hot Spring in 1809 caused the Castle Spring to disappear and to reappear only 14 years later. In 1830, a new wooden colonnade designed by architect Josef Esch was built next to the arbour arching over the Castle Spring. A new Art Nouveau colonnade according to the design of renowned Viennese architect Johann Friedrich Ohmann was constructed on the site in the years 1910 and 1912. The colonnade consisting of three separate structures, i.e. the Lower Castle Spring Colonnade, the Sun Bath, and the Upper Castle Spring Colonnade, was to connect the area above the Castle Spring with the Market Colonnade in order to create a single promenade. In 1913, the rear side of the seep of the Lower Castle Spring was complemented with a monumental Art Nouveau relief of the Spirit of the Springs carved into sinter by Viennese sculptor Wenzel Hejda. In 2000 and 2001, the dilapidated Castle Colonnade was converted into the Zámecké lázně (Castle Spa) Spa and Wellness Centre designed by architect Alexandr Mikoláš. Today, the Castle Spa is accessible only to its guests. Nevertheless, the arbour with the Upper Castle Spring remains open to the public and the Lower Castle Spring has been diverted to the Market Colonnade.